We are proud to inform you that Seabourne Eindhoven is moving. Why? Seabourne has grown exponentially in recent years. The move is an important step in our ambition to expand further and to bolster our position in the national and international express courier sector. We selected the site because of the location, the available space and the appearance, amongst others. As a client, you will naturally experience no inconvenience whatsoever as a result of the move. The other details remain unchanged and do not need to be amended. No doubt you are curious to see what it looks like inside. You are warmly invited for a cup of coffee and a guided tour of our new premises. Seabourne Netherlands has launched a new product for clients sending critical items: Seabourne Pack-Track. Just being able to track something wherever it is in the world and see where it moves in real time seemed beyond everyone’s reach only a few years ago. Today that seems straightforward, using GPS trackers which are able to switch to land based systems using mobile phone masts provides pretty much global cover. Seabourne Pack-Track can track camels in the Gulf, lions in Namibia, daily deliveries across the Atlantic and Amazon orders cross-border in Europe. But clients have responded with a whole set of additional challenges; in pharmaceuticals regulations require temperature sensing; in electronics, humidity can be critical and everyone demands security. Pack-Track can detect temperature, humidity, pressure, light levels and even acceleration. Simply using the light sensor, it even shows where a package had been opened on its journey – hopefully when it’s in the customer’s hand! Parameters and email alerts are configurable via the web portal for events such as breach of temperature range or shock levels, to accurately track delivery. High resolution with an accuracy of up to 6 metres, our products offers real-time tracking anywhere in the world. The Pack-Track web portal shows tracking history, current location and environmental data of shipments enabling full tracing capability. The Nieuw Vennep and Eindhoven teams are busy promoting this latest service and we have already got one making its virgin voyage alongside a unique handcrafted staircase en-route to the United States of America. View our brochure online, click here. Entirely in the spirit of the Triple Helix policy of the City of Eindhoven, LUMO labs startup 'BikeClip' chooses Seabourne Supply Chain Eindhoven as their preferred fulfillment partner. According to one of LUMO's founders Jordie Geuyen a logical choice: "Without partnering an experienced fulfillment partner, you're directly behind 0-1 as startup. No matter how good your idea is, you're always depending on the market and the chosen supply chain. Seabourne provides reliable partners who add value in terms of the distribution and transport of BikeClip. Their knowledge and experience fulfillment, sea freight, air freight and mail service, was decisive for us. " BikeClip is LUMO labs third startup of Dutch soil. No experience or electronic VR features this time, but solid and innovative Dutch Design. BikeClip is a bike stand for each type of bike. The patented and revolutionary BikeClip is patented and holds any bike on its front or rear fork. Protects your bike’s derailleurs or disc brakes. Keeps your bike neatly in an upright position. BikeClip is light weight and therefore easy to travel. BikeClip will launch their first product to the market in November with a crowdfunding campaign on Kickstarter. Through the Kickstarter platform, the creators of BikeClip can pitch their product and pre-sell to individuals and investors. LUMO expects BikeClip to raise € 20,000 on Kickstarter to get mass production started. Through the global network of Seabourne the BikeClips will be shipped globally and directly to the "Kickstarter backers." All good things come in threes! 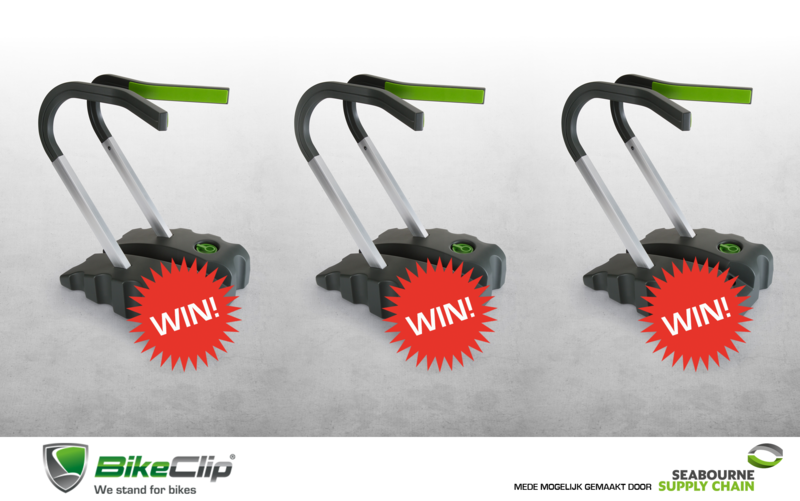 Which of the three BikeClips -made available by Seabourne- are you going to win? Like the BikeClip facebook and type: (SEABOURNE_BC) in the post. Winners will be announced before November 17. How the year flies by! Once again we find ourselves entering the summer holiday period! However, Seabourne are still on hand 24 hours a day. Is your normal point of contact on holiday? Simply contact our customer service team; they will gladly help you. Have you got a good photo of a Seabourne shipment? Send it to: ideabox@seabourne-group.com. All entries will be rewarded with a unique Seabourne beach ball ideal for the summer season! The Seabourne Group wishes you a relaxing and sunny summer!